★Classic, Durable, Compact and Lightweight design. Insulted Rubber foam sleeve(for 16g cartridges only) included to prevent frozen fingers when operating. ★ Fits both Presta & Schrader valves. Washers seal threaded connection ensuring NO leakage. Inflator head designed for all threaded size UNF3/8 CO2 cartridges(12/16/20/25g). CO2 cartridges NOT included. ★ Made from strong and durable aluminium alloy and alloy steel. CNC precisely machined and heat-treated. Three additional spare washers included. ★Reliable and simple control valve for precise adjustment, easy to use. Inflates in seconds and gets you riding again quickly. ★Satisfaction Guaranteed: Both customer satisfaction and product quality are very important to us. So if you encounter any problems, We can provide a full Refund or a Replacement and lifetime warranty! 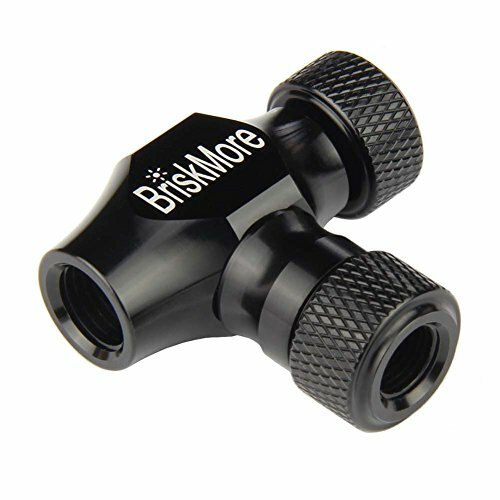 If you have any questions about this product by BriskMore, contact us by completing and submitting the form below. If you are looking for a specif part number, please include it with your message.